good many names and historical records and whatnot, because apparently lots of people search through families that came from (or at least stopped in) Virginia. At some point, my mother was persuaded to join the Daughters of the American Revolution, which was a big deal in her mother’s family. She eventually abandoned the attempt, saying later (much later) to me that they were too snobbish for her. I have no way of knowing if this is objectively true, of course–I was surprised to discover that the organization still exists and has quite a few philanthropic activities. In any event, one of the application processes necessary is to prove through genealogical evidence that one is indeed a descendant of a soldier in the American Revolution (ahem, of course, one on our side–fighting for the British would not, I imagine, increase one’s chances of being able to join). So after I had started getting interested in looking up the family tree, it was treasure trove indeed to find the genealogical worksheet my mother had gotten from one of her relatives. It turns out that the Revolutionary War soldier to whom the link was made was a Samuel Crockett, who was a soldier with a Virginia militia and saw action in the American Revolution. 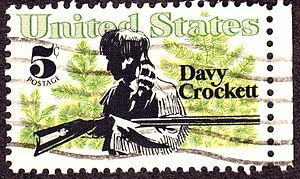 More interesting from my own point of view, Samuel Crockett was apparently a direct ancestor of Davy Crockett, the explorer who served in Congress and who eventually fought and died at the Alamo. This made me rather popular when I was a child, although a few people now, when informed of my one and only genealogical claim to fame, have a tendency to say ‘who?’. A dear friend years ago did more genealogical research on that side of the family for me and found evidence that the Crockett family originally hailed from France, their name then being Crocketaigne. (Of course, we all originally hail from Africa, so this is a kind of interim origination.) According to records found by my friend, the founding member of this branch (where do you place the cutoff, by the way–every founding member of a family has a father and mother) was an actual Musketeer, doing the same work and living in the same era as the fictional “Three Musketeers”. From research, my friend told me that this Crocketaigne married a member of the French court, but they left France and moved to Ireland, supposedly because they were Huguenots. (My own feeling is that this makes little sense, because why would a Protestant being kicked out of a Catholic country, which is basically what happened to the Huguenots, go to another Catholic country, but that’s what the research indicated.) From there, the Crocketaignes, now Crocketts, immigrated to what was then not quite yet the United States. Interestingly, my mother’s father’s family tree has quite a few leaves as well. There seems to be a groundswell of interest in those looking up their Swedish origins. Of course, not being able to speak Swedish (I know, that disappoints me too), I can’t decipher any actual records kept within Sweden and so need to take some other family tree researcher’s word for the names and locations. But still, there seem to be a sprinkling of Persdotters and Ericsons who lived in the middle of Sweden who are probably my long ago ancestors. I do know that my grandfather came to Virginia as a boy to get work. He met my grandmother there and, after the birth of my mother, in 1913, they moved to Oneida, New York, where my grandfather worked as a forger at Oneida Community Silverplate. That always fascinated me as a child, because of course I thought if he was a forger, he was forging documents or money or pictures, but it’s not nearly so romantic. The forger at the silver factory forged the knives, rather as a blacksmith forges iron gates and whatnot. So my mother was born in Virginia but raised in upstate New York. She met her first husband there (he was a chef on the big ships that plied the Great Lakes) and she met my father there–his family being from the Syracuse, New York, region. One aspect of research into family history that delights me is the historical vignettes one comes across. For example, in my researches just into my mother’s side of the family, I’ve discovered more about the history of the Oneida Community and the wider and deeper history of the utopian movement that led to such communities being established in upstate New York. This is why there are so many names in that region that are taken from Greek, Roman and other classical sites, such as Oneida, Troy, Rome, Syracuse and so forth. Nineteenth Century men and women, in an attempt to create a perfect society, would come to the United States, set up what is no more or less than a commune, and attempt to live by classical or Republican (in the classical sense) or other ideals. The vast majority of these utopians, as they were called, ended up dissipating (as did the more recent communal efforts), but Oneida Community, seeing the handwriting on the wall, turned their apparently considerable talents to figuring out a way to survive in the real world, and started silverplating flatware. They still do, creating a high quality product. I have no family ties with anybody who created or lived in the Oneida Community when it was a utopian experiment, but my grandfather was employed by them throughout his working life, even during the depression, when he would work one or two days a week only. So there’s a tie of interest, if not of family. But back to genealogy. While I have been able to climb the many branched maternal tree, the problem comes with my father’s side. No matter how I search or what I search through, I cannot seem to get past my great-great grandfather (father’s father’s side) or my grandmother herself (father’s mother’s side). Now, in the case of the Willwerths (my maiden name), my great-grandfather Fredrick was apparently, according to census records, born in upstate New York, and lived in Syracuse most of his life, but I can find nothing about his parents at all. And more, the family story (undoubtedly apocryphal) is that my great-grandfather’s name was Carl (or Karl) and that he emigrated from Germany, from Bavaria. But I can’t find any records of that either, even in the detailed shipping manifests that have been published on the ancestry.com site. Further, census records indicate that the family came here from Prussia, not Bavaria. I don’t speak German, either, so even looking at birth or baptism records from Bavaria or Prussia is beyond me. So I’m obviously not experienced enough a researcher to cut through this particular thicket. Worse, my father’s mother (whose full maiden name, Nellie Ann Pitcher, I finally discovered by diligent search through every piece of paper signed or written or filed by my father) seems to be an entire roadblock all by herself. I cannot find any record of her birth, nor can I find any records of her parents. Frustrating but interesting, all at the same time. What I am discovering, if not new leaves on my tree, is several facts about genealogy. First, that amateur genealogists have a tendency to accept all possible records, thus ending up with a family tree in which, sometimes, the dates of the parent generation simply do not match those of the children. I have often read through records in the ancestry.com database in which the last three or four children were born after the mother’s date of death, which does seem miraculous. In another instance (on the Swedish line), I discovered a marriage between a man born in 1740 and a woman born in 1688. Who died in 1720. I don’t think so. I try to filter those through what little common sense I have before adding the records to my tree. Even more frustrating is the cavalier way in which our ancestors got born, got married, had children, lived, and died without anybody thinking it would be a good idea to write down the circumstances. My own father did not, apparently, have a birth certificate. When it was necessary in order for him to join an officers’ candidate school class in early WWII, he had to get a notarized affidavit from his father attesting to the date and (presumably) the fact of his birth. My mother also did not have a birth certificate. Even more perplexing, the spelling of my father’s name, Willwerth, appears differently in practically every record I’ve been able to unearth (are we really ‘unearthing’ when we’re searching the Internet?). Wilworth, Wilwert, Wilwerth, many others. Are they simply misspellings or mistranscriptions of the name, or are they different people? In addition, I keep finding the right name but in the wrong place. To my knowledge (which isn’t that comprehensive, of course), my direct Willwerth ancestors never lived, traveled, moved to or even thought about Michigan, but I keep finding records giving the correct name and the right time in Michigan. Sigh. I’m not sure that any but other hobbyists like myself will find this interesting, and those hobbyists, undoubtedly being much better and more experienced at it, will laugh (perhaps reminiscently, because we all start somewhere) at my fumblings. But this is my own small part in history and I’ve always loved history. It is quite amazing to have discovered that an ancestor of mine was perhaps a genuine Musketeer serving the King of France, or that my great-grandfather owned a livery stable in Rome, New York just before the advent of the internal combustion engine. It makes history come alive in a way that even the best book does not. Real people did those things, and not just kings and princes and presidents and generals, but the forgers (this still makes me giggle) and the train conductors (my paternal grandfather) and the Revolutionary War soldiers. Perhaps someday I will find out about more of the contributions of the men and, harder to find but as or more important, the women who are leaves on my family tree. Simply wanna input on few general things, The website style and design is perfect, the subject material is rattling superb. “Good judgment comes from experience, and experience comes from bad judgment.” by Barry LePatner. I should really try to find out more about my family. I know where to start on my mother’s side (Warsaw, my grandmother’s maiden name–Greiczer) but my father’s side would require a lot of digging, and unfortunately, my family isn’t on good terms with my father’s side of the family. Long story, but that route’s closed to us. Sigh. I have the same problem with my father’s side. I have no communication or way of communicating with any of my father’s surviving relatives. I think my mother did that deliberately after my father died, which is also a long story. But finding the others has been a hoot! I’ve merely began with my site and I really love this template. Is it free or one of those premium templates? Sorry, I’m new to this and just looking for suggestions. BTW, I check your site nearly daily. I conceive this site contains some really superb information for everyone :D. “Laughter is the sun that drives winter from the human face.” by Victor Hugo. I actually wanted to send a word in order to say thanks to you for the pleasant ideas you are showing on this website. My extensive internet research has finally been rewarded with sensible suggestions to write about with my relatives. I would point out that many of us visitors actually are undeniably endowed to exist in a remarkable website with so many outstanding professionals with good pointers. I feel extremely fortunate to have used your entire website page and look forward to many more fabulous minutes reading here. Thanks a lot once more for a lot of things. Sweet web site , super design and style , real clean and use pleasant.